Submitted by admin on Sun, 03/09/2006 - 17:11. The community center's given us some updated details of when the center will be closed. The club won't be held on Saturday the 23rd of September. It will be held on Saturday the 30th (ignore what this message used to say). Submitted by scatterlaser on Sun, 27/08/2006 - 16:34. The Ladies of the Night clashed with Death Wears a Green Singlet last week while attempting to liberate the strippers at the Pit Bar and Grill. The Singlets, who own the Bar, met the Ladies in bloody combat, both sides inflicting casualties before the Eschers decided to make a tactical retreat with their rescued sister. Much to the surprise of the Ladies the stripper was not Plenty O'Toole, but Singlet member Weird Simon! It appears that Weird Simon was in drag as part of a bet when the battle took place, and the Eschers mistook him for Ms. O'Toole in the melee. Submitted by waargh ben on Sun, 27/08/2006 - 12:41. You may or may not be aware, but im a commission army painter, so rather than the usual single-model commission jobs, i do whole armies(themeing, converting and/or painting). 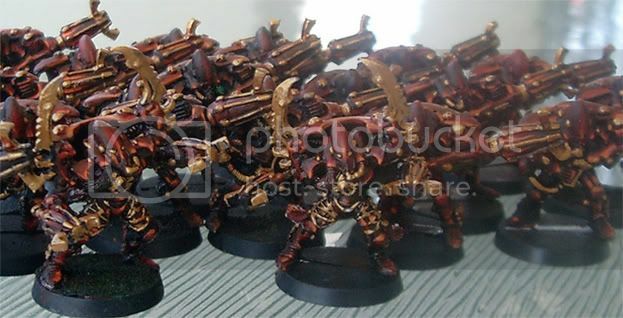 Anyway, i painted up 30 warpspiders around christmas for a guy's army. Submitted by scatterlaser on Wed, 23/08/2006 - 21:37. The week long peace which had settled like a blanket over the Slime Pit Harbour area was shattered yesterday when Heinrich's Heroes and the Ladies of the Night ran into each other while scavenging. In a rare display of cunning tactics, the ladies made use of smoke grenades to cover their advance. Unfortunately, a lack of familiarity with the weapons combined with strong winds thwarted their attempts, and left them open to incoming fire. Heinrich's Heroes made excellent use of their newly acquired needle sniper rifle, taking three unlucky ladies out of action at long ranges. The ladies retaliated with a long range heavy stubber burst which killed on of the Heroes outright. The Ladies eventually fled clutching their two lucky finds when both their leader, Amanda Stabb, and on of their shotgunners were downed by Heinrich's men. Submitted by scatterlaser on Tue, 15/08/2006 - 22:39. Heinrich's Finest, new Orlock boys have been handed an ignominious defeat at the hands of the Ladies of the Night. The Orlocks and Eschers clashed in downtown Slime Pit Harbor early last week. A protracted duel ensued between the two gangs heavies, both firing hundreds of rounds from their heavy stubbers. Accuracy was amazingly high, but the weapons proved extremely ineffective. Much more effective was the fusillade of short ranged scatter shot the Eschers pumped into three of the Orlocks taking cover behind a first floor re-enforcing buttress. Submitted by puddingwrestler on Wed, 09/08/2006 - 21:24. And lo, in the sixth year of his reign didst El Presidente Gregor ascended Mount Hamptonius and didst speak unto Glod. And Glod said unto him â€œLet there be a number of commandments for the ruling of your club, and let them number ten. Yea: ten commandments shall there be, and in their number shall they be ten. Not nine, nor eleven. Twelve is right out of it. And I shall give unto thee these commandmentsâ€ But El Presidente didst understand not, for Glod was a Dwarf, and spake unto him in Khazalid, the tongue of the Dwarves. Submitted by scatterlaser on Tue, 08/08/2006 - 22:06. SHAM SLAMMERS SLAMMED BY GLAM! Notorious muscle-men the Sham Slammers were surprised last week when they went out scavenging and got more than they bargained for. Out amidst the ruins and crud-tanks of Sump Pump Central they ran into those goddesses of glam, the Ladies of the Night. It was a short battle - the Goliaths, their brains obviously fogged by steroids, walked right into the line of fire of Vanessa Bang's heavy stubber. This was quickly followed by a lucky shotgun shot from Tara taking another Goliath down. The Slammers wisely chose to flee, leaving the girlz in possession of the field of battle. Submitted by admin on Mon, 07/08/2006 - 11:56. We recently got a note from the Hampton Community Center with a few reminders in it, which I thought I should pass on here. We're not allowed to be use the kitchen, so if people could please stay out of there, that'd be good. We're also not meant to use the phone out the front - if you need to call people, there are phone boxes on the main street nearby (that or bring a mobile). While I'm at it, if you could throw any plastic bags/empty bottles/old chip packets/etc in the bin on the way out, it'll save other people having to later on (there are bins out the front). Thanks for the help, and let us know if you need help finding a phone or the bins or anything. Submitted by scatterlaser on Sun, 30/07/2006 - 16:15. Geodesic XII, the newly discovered dome was the scene of a terrible bloodbath yesterday. Magos Caldrev, escorted by local Orlock gangs and a local Bounty Hunter was attacked by a motley coalition of outlaw scum desperate to claim the riches for themselves! The outlaw coalition consisted of Ratskins, escaped Pit Slaves and (reports have yet to be confirmed) possibly even the Ladies of the Night â€“ local Escher heroines! Submitted by scatterlaser on Thu, 27/07/2006 - 17:14. A minor hive tremor in the vicinity of Ash Falls caused a major land slide last week. Residents of the settlement where astonished when the entire side of Mt. Pukastinkee broke off and collapsed, revealing the derelict remains of a maglev line. Their amazement could only be increased by the discovery that the maglev lines led to a lost dome! Enforcers set up a perimeter to prevent civilians from endangering themselves until an official investigation and exploration could be made. The dome is believed to be Geodesic XII, a dome which was lost over seven thousand years ago. Ancient hive maps designate it as a classified manufactorum dome.